The son of a Yorkshire mill-owner, John Higginbotham was born in Bradford in 1933, and was educated at Bradford Grammar School from where he won a Classical Scholarship to Cambridge, gaining a First in Classics and winning a number of prizes. After two years’ National Service, training and then working, as a Russian translator in the R.A.F. he joined the staff of Lancing College, Sussex, as a Classics Master. He remained at Lancing, a public school in the Anglican tradition, for 24 years contributing in many way to both the academic and community life of the school. Notably he organised and led visits to archaeological sites, to classical plays and also summer holiday tours to Italy and Greece. He was in addition for his last ten years at Lancing the House Master of Teme House, giving the House a much wider focus than the traditional sports role, but also including a strong cultural programme of concerts, plays and debates. In 1981, to the surprise of many of his friends and colleagues, he took a gamble with his career by coming to Leicester to help a newly created local trust to establish an independent grammar school with ambitious academic aims in the City following the recent conversion of Leicester’s traditional grammar schools into comprehensive secondary schools or sixth form colleges. The school had acquired a lease on the 19th century buildings of one of the original grammar schools situated next to the Cathedral, and a strong link was immediately forged between the two, as part of the School’s Anglican ethos. Under Higginbotham’s leadership as Headmaster the Leicester Grammar School quickly grew and flourished: having starting with only 96 pupils and 12 staff in its first year, the school reaching 560 pupils within ten years. Academic excellence was the school’s main aim and achievement, but as in Teme House at Lancing, music and the arts also flourished. He was also always keen to see any prospective pupil who would benefit from an academically rigorous education was admitted to the school, regardless of parental means. Even in the early days, scholarships were awarded from the school’s meagre funds, and later Leicester Grammar was one of the first independent schools to be admitted to the Government’s new the Assisted Places Scheme. Election to the Headmasters’ Conference and with it Public School status was achieved in 1993, just 12 years after the opening of the school. Higginbotham led from the front, teaching a timetable which most headmasters would regard as punishing. He taught not only Classics throughout the school, but also Russian which he had learnt at Cambridge during National Service. He accepted a wide range of speaking engagements and it was these, as well as his constant meetings with parents, showing several pairs round the developing school each day, that built up the growing reputation of the school. It succeeded more than any other new school at that time in making its mark for academic excellence, while the school’s distinct family atmosphere was due in no small part to the pioneering spirit Higginbotham engendered in its formative years. His complete faith in the venture and his ability to convey an air of utter confidence, despite the doubts of many, most surely made the difference between success and failure. Retirement from Leicester Grammar School in 1989 gave Higginbotham’s energies increased scope. An MA in Applied Linguistics occupied his first year of his retirement, after which he was invited as a lecturer and teacher, not only at the two universities in Leicester, but also in York, London and Cambridge. Higginbotham was a committed Christian and a life-long member of the Church of England. He was a person of devoutly Anglo-Catholic views and yearned for closer union with Rome. In 1990 he was awarded a Frank Fisher Fellowship for ecumenical studies which took him on repeated visits to Rome and won him valuable contacts with the Roman Catholic hierarchy. The admission of women to the priesthood was a blow he felt deeply, bringing as it did an end to all hopes of union with Rome for which hopes were running high. He became Lay Chairman of Forward in Faith in the Leicester Diocese and sought to minimise what he saw as the more damaging effects of the legislation. But unlike many who had become disillusioned with the liberal agenda in the Church of England, he remained loyal to it. He was elected to the General Synod in 1995 where he was a regular and often witty contributor to its debates. He remained a member of the Synod up until his death in Leicester at the comparatively early age of 63, and in line with his Anglo-Catholic tradition his funeral was at the Church of St. Mary de Castro. Higginbotham was very active in many other areas of life. While at Lancing In Sussex he had founded the Sussex Association of Classical Teachers, becoming its President, and he was later national president of the Classical Association. In Leicester in addition to his Lit and Phil presidency he was also President of the Leicester Classical Association. On the national stage he was Vice-Chairman of The European Atlantic Movement (Team), which organised conferences on international affairs throughout the country. Higginbotham was an indefatigable traveller, whose international perspectives contributed much to the Movement. 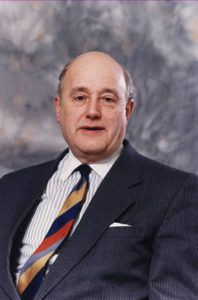 His long association with Lancing College was renewed with his appointment as a Fellow of the Woodard Corporation (which governs Lancing) in 1996. His publications included two substantial translations and commentaries on the Classics: Cicero on Moral Obligation (Faber & Faber 1967), and Greek and Latin Literature – a comparative study Methuen, 1969), and also contributed articles to the International Journal of Educational Management. Presidential Address: The Eye of the Cyclops Trans. LLPS vol. 88 (1994), pp. 1 – 4. Sources: John Higginbotham’s Obituary [for Lancing College] by Very Revd. Alan Warren (Provost of Leicester Cathedral 1978 – 1992); John Higginbottom: Headmaster who taught Classics and Russian and who believed in scholarships for students without the means The Times 21 March 2007 [unsigned but by Very Rev. Derek Hole]; John Higginbotham [obituary] Church Times 16 February 2007. (With thanks to Michael Kirk, Leicester Grammar School and Very Rev. Derek Hole for their considerable assistance).